YOU GETS WHAT YOU PAYS FOR by Jim Corbran, Automotive Columnist Having just bought a car last week, I was wondering to myself what might the family-car buyer get for his/her money if they are (unlike me) in the market for a brand-new vehicle. So I decided to see what were the least- and most-expensive family-type cars on the market at WNY dealerships. This week we’ll take a look at traditionally American nameplates. 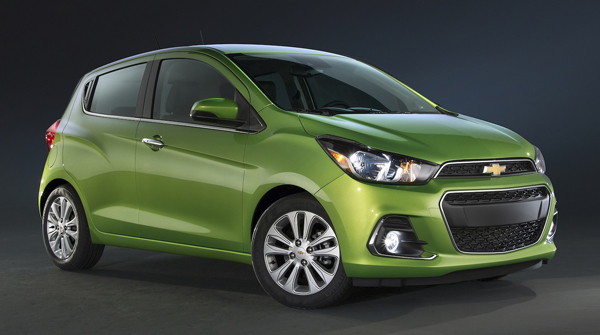 At the bottom of the heap (or, the top depending on where you stand) is the 2016 Chevy Spark, with a starting price of a mere $12,660 with a manual transmission. This will get you a 1.4L Ecotec 4-cylinder engine which puts out 98 hp and is connected to a five-speed stick shift along with (among other stuff) front-wheel-drive, 4-wheel ABS, power steering, AM/FM stereo, tilt wheel, a/c, two “rigid” keys, and crank windows. Pricing one on Chevy’s web page, with zero options, bottomed out at $13,535 with freight. Going in the other direction we find the 2016 Cadillac CTS-V sedan which starts at a lofty $83,995. Under the hood is a 6.2L supercharged V-8 rated at 640 hp which is connected to an 8-speed automatic transmission driving the rear wheels. Also as standard are Brembo front high performance brakes, magnetic ride control, a Bose 13-speaker Centerpoint Surround Sound system, keyless access w/push-button start, and yes, power windows. And an arms-length list of other stuff. With no options my build-your-own CTS-V was priced at $85,990 with freight. In a car-buying mood? Build your own versions at the links below. Build your CTS-V or Spark by clicking on the names. Next week we’ll look at the import brands. ### The post YOU GETS WHAT YOU PAYS FOR appeared first on Buffalo Cars.